Pinterest has become an important platform for many businesses that share visually compelling content with their highly engaged audiences. It is an excellent way to promote your brand and drives traffic to your business. It’s powerful advertising platform drive s performance marketing through the concept of share & idea finding. Here are 9 Pinterest advertising best practices to make sure you maximize the potential and results, driven by your campaign. This is a best practice that marketers should keep in mind. Vertical images draw Pinners’ attention because these pins take up a lot more screen in the Pinterest results. These images show up much larger in the feed than horizontal ones do. Best size is a vertical aspect ratio of 2:3 to around 1:3.5 with a minimum width of 600px. 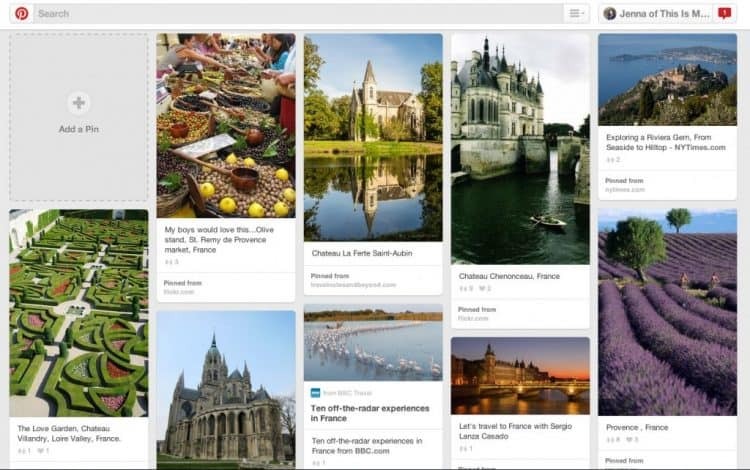 For example- The vertical images on France travel board are easier to see and have more repins than the smaller horizontal ones. Your promoted pin campaign with A/B testing offers you deeper insights into what your target audience is going to like and dislike. Always run promoted pins with numerous different images and messages. Split-tests help you to achieve better results using two or more of your promoted pins and analyze the results. You can test ad creative (pin image), ad copy (pin description), and landing pages to maximize your Pinterest ads campaign results. Note- Pinterest improves for click-through rates and not conversion goals. Pinterest inspires advertisers to keep Promoted Pins “attractive, actionable, and encouraging.” As you’re paying for your Promoted Pins, they should be some of your best. This Pinterest ads guide focused on how to use Promoted Pins to showcase your business on Pinterest, but keep in mind that the platform offers many free ways to help promote your business, too. As marketers know, desktop and mobile perform far differently from a conversion point, and mobile has higher CTR and lower CPC. However, in this example, we see that desktop has a higher ROAS because its conversion rate is superior. One major benefit to sorting out engagements by the campaign is that you can manage the costs separately. Pinterest is 80% mobile and if you want desktop to receive traffic, so be sure to separate it out. The best-promoted pins are those that are able to draw more engagement through organic activity. The real efficiency comes from the “viral effect” of your pin. You can launch your campaigns with this viral effect by repurposing your best organic pins, which have organic engagement. For inspiration, check out Pinterest’s Great Promoted Pins board. Pinterest promoted pins uses keyword-based marketing technique to make it more strategic and targeted. It is making efforts towards getting closer to exact match. By optimizing your campaign with right keywords, you make it more appropriate to search queries of your target pinners and increase chances of users clicking on your sponsored pin. With a set of 150 keywords per promoted pin, it gives you sufficient power to gain more visitors from a range of competitive keywords. Calls to Action (CTA) buttons are helpful in prompting your audience to take the next step. Pinterest only allows CTAs that do not make a direct selling try. So, you need to be alert while building your CTA descriptions. Firstly, understand your target audience and be sure to have a significant offer. If you’re running a keyword or retargeting campaign, it’s fine to offer a hot offer like “purchase,” “buy now,” “shop today” or “sign up”. For any successful promoted pin campaign, a business must understand its target audience. Once you identify whom you’re talking to, break out campaigns to match respective audiences to show consumers what they want to see. And don’t forget, Pinterest searchers are already inspired and motivated, so be desirous to engage them. Pinterest targeting allows you to pinpoint audiences by location, language, device and gender. Therefore, it’s important to target the right audience at the right time, based on significant keywords. Pinterest marketing is all about valuable content. You can use some good analytics tools that help you to increase your traffic and get you the most out of your marketing campaigns. You can count your impressions, clicks, engagements, downstream engagements and conversion rates in your Pinterest Analytics dashboard. Take a slow method, twist your campaign by analyzing the behavior of your audience, and keep an eye on the conversions and goals. Some tools are pretty expensive but Pinterest’s own analytics is free. However, all have free trials Pinterest Analytics Tools to Maximize Your Pinterest Marketing Campaign. Pinterest is both visually and search-driven. So, it’s important to highlight creative and keyword strategies equally. It is all about sharing and communicating, but it’s also about searching and watching. Above mentioned practices help you to get more value out of your Pinterest marketing efforts. It can help you reach millions of new potential customers that you wouldn’t have been able to reach before.